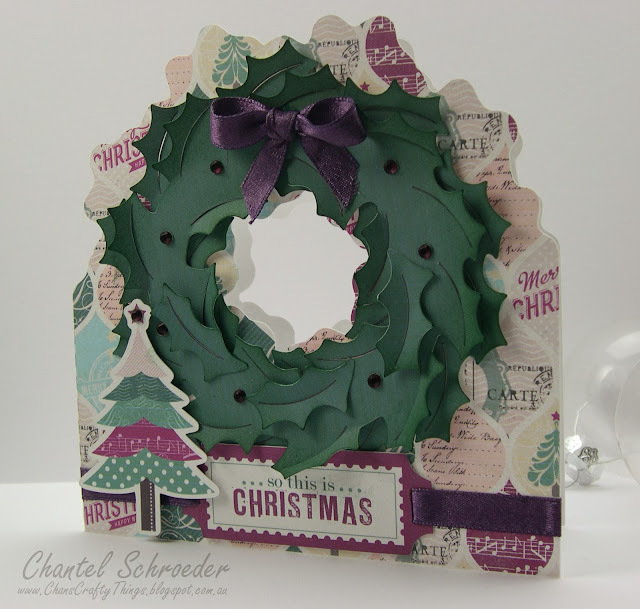 I wanted to make the Wreath Card from the newest SVGCuts kit, Silent Night. As you know I love using the print and cut feautre on my Cameo so I picked out some nice digital paper by CartaBella (So this is Christmas) and proceeded to fill all my pieces in the Silhouette DE program. I thought the card would look really nice in this paper as it is very "Christmassy" with lots of different reds and greens. 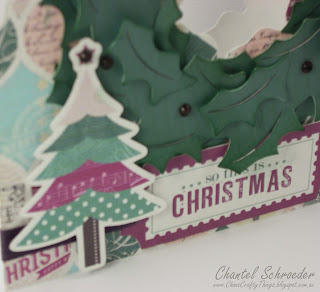 There were also a few elements that I really liked so I thought I would print and cut them too and use them as embellishments for my card. I then set my registration marks and sent my images to the printer. But this is where it all went wrong. For some reason, my printer decided that it didn't want to play along and as you can see, the lovely reds in the digital paper printed almost purple! Not at all what I had in mind... Oopsie!! I felt really frustrated when I first saw that the colours didn't print correctly but then I thought I might as well run with it and cut it out (probably just because I like to see my Cameo do it's magic). I assembled the card, added a couple of the digital elements I had cut out (which fortunately also printed in the wrong colours so it matched the rest of the card perfectly), a few rhinestones and some silk ribbon and voila... the strangest coloured Christmas card you'll ever see... lol! Certainly not your traditional Christmas colours, I know, but strangely enough, I think I kind of like it...? I would love to hear from you - please leave a comment below. With a bit of a paper addiction, my favourite crafting tool has to be my Silhouette Cameo. However, I also enjoy working with chipboard, wood, fabric, glass and even metal... I love baking and enjoy candle and soap making too. I know it's been a good day when I have glue or ink stains on my fingers - as this means that I've had time to do something that I really love. Thanks for stopping by, please leave a comment and come back again soon for a visit. You're My Cup of Tea! Upside Down Miniature Cake Box - SVGCuts Guest Post!